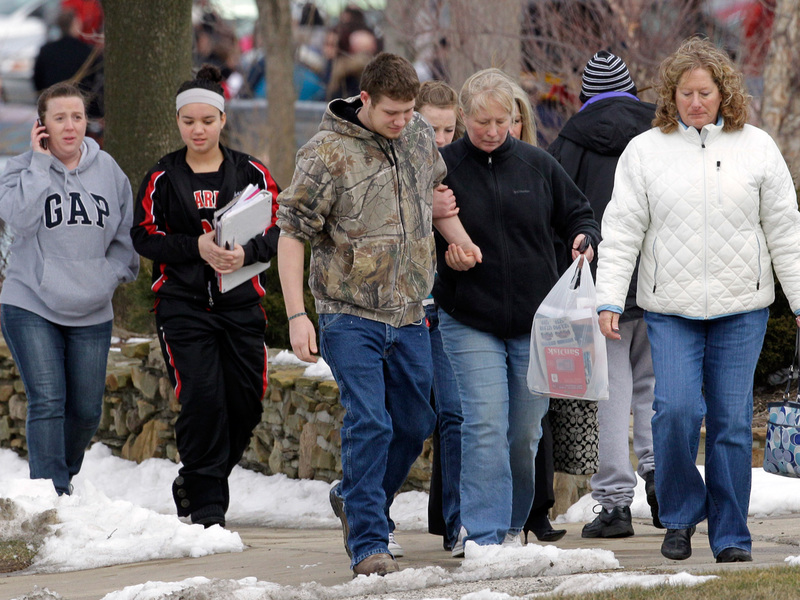 CHARDON, Ohio - A teenager described as a bullied outcast at his suburban Cleveland high school opened fire in the cafeteria Monday morning, killing one student and wounding four others before being caught a short distance away, authorities said. A student who witnessed the attack close-up said it appeared the gunman was targeting a group of students sitting at a cafeteria table and that the one who was killed was trying to duck under the table. Panicked students screamed and ran through the halls after the gunfire broke out at the start of the school day at 1,100-student Chardon High, about 30 miles from Cleveland. The suspect, whose name was not released, was arrested near his car a half-mile away, the FBI said. He was not immediately charged. The Geauga County Sheriff's Office said that the suspect turned himself in after being chased out of the school by a teacher, CBS News reports. FBI officials would not comment on a motive. But 15-year-old Danny Komertz, who witnessed the shooting, said the gunman was known as an outcast who had apparently been bullied. "I looked up and this kid was pointing a gun about 10 feet away from me to a group of four kids sitting at a table," Komertz said. He said the gunman fired two shots quickly, and students scrambled for safety. One of them "was kind of like hiding, trying to get underneath the table, trying to hide, protecting his face." The handgun allegedly used in the attack has been recovered and is now in the custody of the Bureau of Alcohol, Tobacco, Firearms and Explosives, where authorities are running a background trace on the weapon to determine its origin and ownership, CBS News correspondent Bob Orr reports. There is no word yet on the number of shots fired or the caliber of the bullet. Parmertor's teacher at Auburn Career School had no idea why Parmertor, "a very good young man, very quiet," had been targeted, said Auburn superintendent Maggie Lynch. The sheriff's office identified the other victims as three male students and one female student. Earlier, CBS affiliate WOIO-TV in Cleveland reported on air that a 17-year-old boy was listed in serious condition and an 18-year-old woman was in stable condition at the Cleveland Clinic's Hillcrest Hospital in suburban Cleveland. The sheriff's office said that two students were taken to Hillcrest Hospital and an additional three students were taken to MetroHealth, CBS News reports. Parents thronged the streets around the school as they heard from students via text message and cellphone long before official word came of the attack. By midday, officers investigating the shooting blocked off a road in a heavily wooded area several miles from the school. Federal agents patrolled the muddy driveway leading to several spacious homes and ponds, while other officers walked a snowy hillside. It wasn't clear what they were looking for. A police dog was brought in. Heather Ziska, 17, said she was in the cafeteria when she and other students heard popping noises in the hall. She said she saw a boy she recognized as a fellow student come into the cafeteria and start shooting. She said she and several others immediately ran outside, while other friends ran into a middle school and others locked themselves in a teachers' lounge. "We all have cellphones, so people were constantly giving people updates  about what was going on, who the victims were, how they were doing," Moser said. Chardon is a town of about 5,100 people.